I know that many of you expect more news about the desktop part of the GeForce 700 series, but you should not forget that there are also mobile graphics cards, coming right after the desktop models (supposedly in June). These cards are high-end GeForce GTX 780M, GTX 770M and GTX 765M. 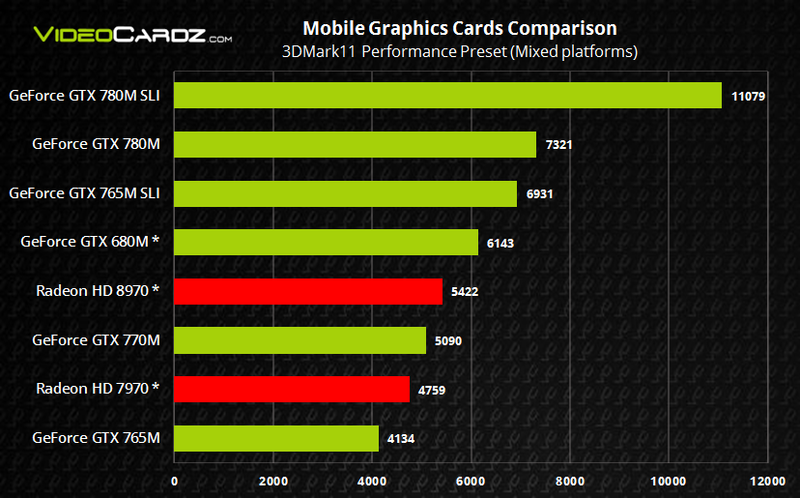 This is the first comparison of these GPUs you will find on the net. This is a comparison between GeForce 700 cards. Radeon graphics cards are not the subject of this post, although I’ve included one chart with them. 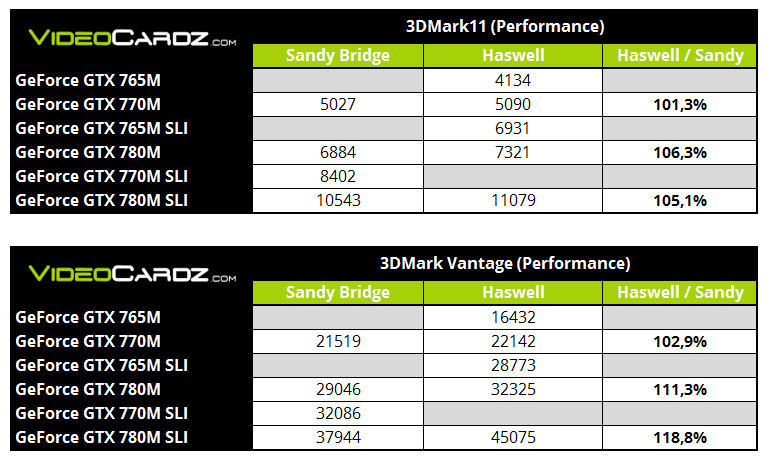 Thanks to my special contributor (Agent 007) you have a chance to learn about the performance of three, yet unannounced, graphics cards, what is more, we even have the results in SLI configuration.You will also learn what is the difference in terms of graphics performance between the Haswell and Sandy Bridge platforms. But first and foremost, I would like to inform all Alienware M18x users, that you can replace your graphics cards to the newest Kepler series — GTX 780M, GTX 770, GTX 765M and so on, without any issues. Before we get to the tests, let me introduce to you the newest high-end Kepler model once again. 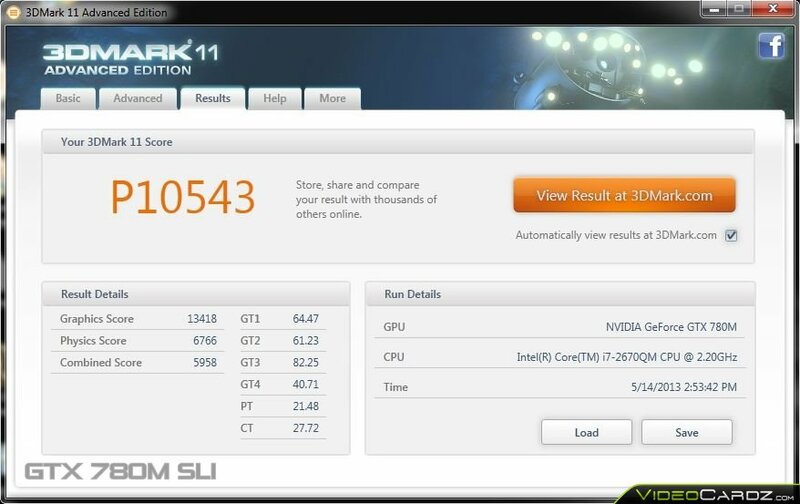 In my previous post I told you that GeForce GTX 780M is a desktop GK104 derivative, codenamed N14-GTX-A2. What I forgot to tell you is that the GTX 780M is in fact the same graphics card as GTX 680MX. The MX is an exclusive model for iMac, and that’s it. Now every enthusiast will be able to have it, even those who have 2 years old notebooks. In comparison to GTX 680MX, there are only cosmetic changes. The GeForce GTX 780M is clocked higher than its predecessor — 771/797 MHz for base and boost respectively. Furthermore, you should also know that GTX 680MX did not have a boost clock. It’s worth noting that GeForce GTX 780M can be successfully overclocked to 950-1000 MHz levels. This will increase the performance by additional 15% (outperforming GTX 770M SLI). Moving forward to GeForce GTX 770M. You could say that GTX 770M is a GeForce GTX 675MX in disguise, but it’s not, at least not entirely. 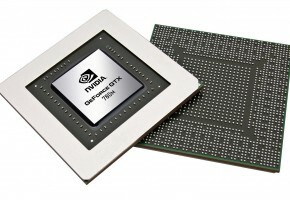 In fact, the GeForce GTX 770M is more like GTX 670MX, due to 192-bit memory bus. 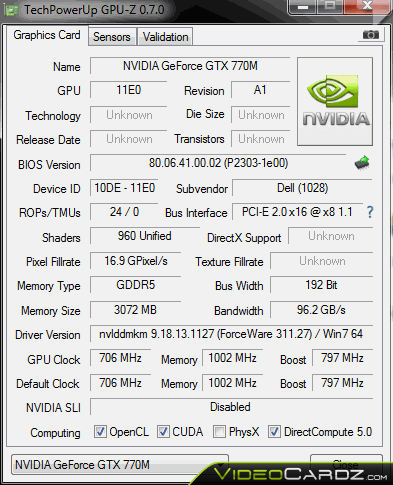 The GTX 770M runs at faster GPU clock (706 vs 600 MHz) and it has the boost clock as well (797 MHz). Also the memory has been overclocked to effective 4GHz. So yes, there should be a noticeable performance change between the old and new Kepler. Further, let’s not forget about the GeForce GTX 765M. I don’t have a confirmation about all specs yet (no GPU-Z shot), but I know it has less CUDA cores than both, previously mentioned, cards — 768. The reduced number of cores is technically the only change you will notice by comparing it to GTX 670MX. So now let’s take a look at the tables. For the sake of clarity I have split the data into few charts. Tests were performed with Alienware M18x notebook, i7-2670QM Sandy Bridge processor and i7-4800MQ Haswell processor. I made some comments, mostly for 3DMark11 results. With a score of 11079, the GTX 780 SLI scaling is quite good, thus the result is very similar to the performance of a desktop Radeon HD 7970 GHz Edition. 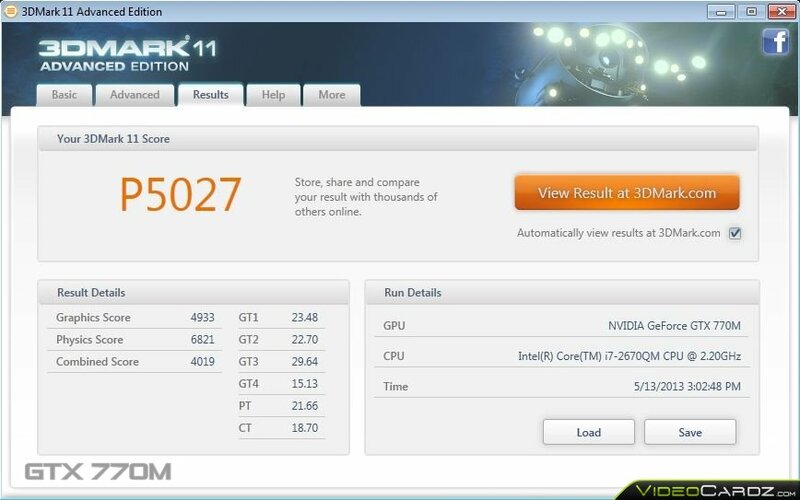 Single GeForce GTX 780 scores 7321 points, which is near the speed of the Radeon HD 7870. On the other hand the GTX 770M could possibly compete with the GTX 650 Ti Boost, but only after some clocks manipulation. Furthermore, you should expect a performance of Radeon HD 7770 from GeForce GTX 765M. This card also benefits from SLI, you can easily reach the score of the GTX 780M, since the card is clocked at rather low speed. In this test we are missing the score of GTX 765M, but we have the GeForce GTX 770M in SLI. The mixed platform chart was made in order to show the gap between the Intel and AMD platforms. 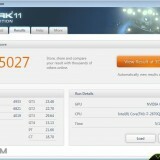 Radeon HD 8970 tied with A10-5750M APU does not offer a good performance. In fact, even the GTX 680M can outperform it. The chart would look more promising for AMD if we had HD 8970M results running on Intel platform, but since the card was just announced, we will probably have to wait few weeks for that. 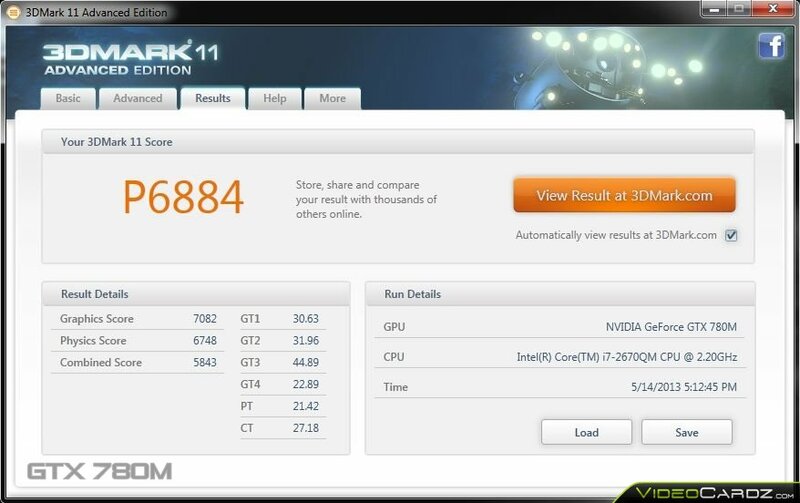 Note that the results of GeForce cards were performed with the Haswell processor. 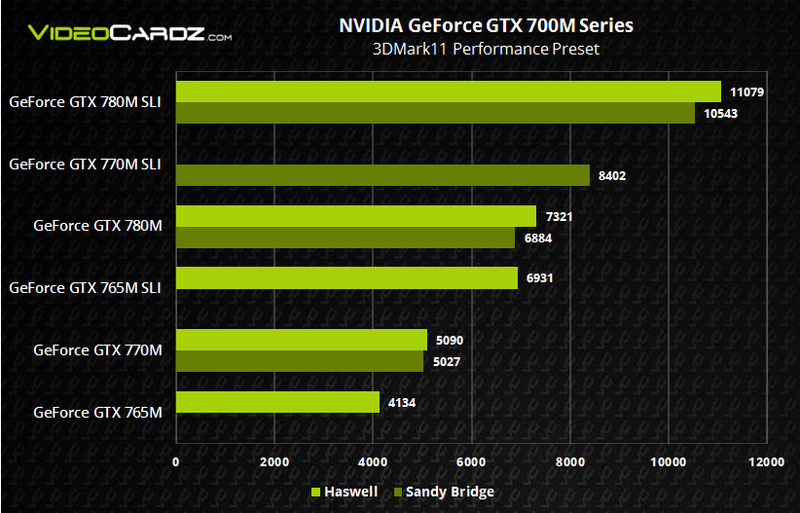 Synthetic benchmarks revealed that the GeForce GTX 700M series running on the latest Haswell architecture gain between 7% and 10% in comparison to Sandy. This is very important information, especially for Alienware users (tests were performed with these notebooks). If you happen to own a Sandy Bridge gaming laptop, then switching the GPU to GeForce 700M series model should not be a problem at all, and because of the very good overclocking capabilities you can speed up your card even faster. The charts below indicate that GTX 770 running on both platforms offers almost the same performance, in fact, the difference is so small that most of you wouldn’t even notice it while playing. On the other hand, the GTX 780 runs smoother on the newest platform. Finally the charts (gray areas indicate missing scores). I’m not adding all screenshots from the tests, because there are too many, but here are 3DMark11 scores with Sandy Bridge, so that you know that the data was not taken from the thin air. Please note that the charts may be updated if the new data will be provided.